Your Total Guide to Delicious Vegan/Vegetarian Recipes & Where to Buy & Eat! This noodle dish which comprises of thin wonton noodles and fried mocked meat is commonly available at vegetarian stalls in Singapore, it is also known as Gan Lao Mian 干捞面, meaning dry noodles using Mee Kia (thin wheat noodles). 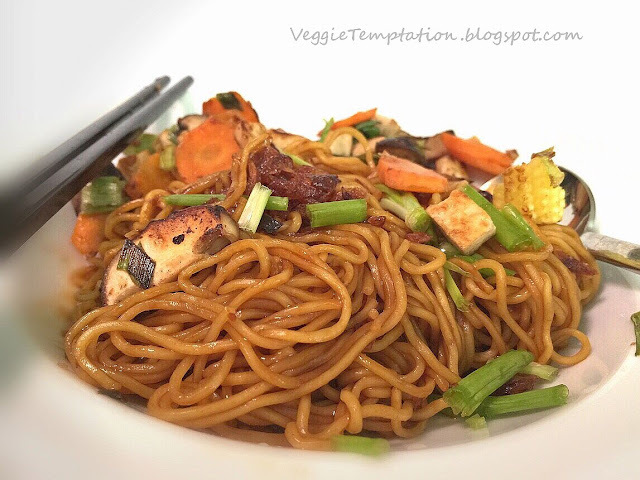 This is my perfect quick weekday dinner dish when I want a bowl of noodle yet do not have the time to do the wrapping of the wonton, check out my Tofu Mushroom Wonton. It is nutritious too with all the veggies, oh well, dinner ready within 15 minutes, yes literally! 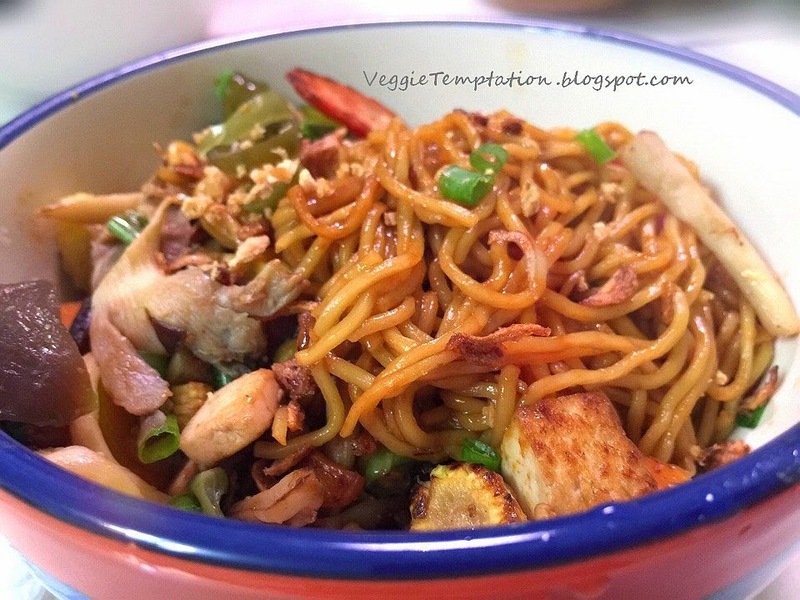 Where to buy the best raw eggless wonton mee in Singapore? Click here. 1. Heat up a pot of water to boiling point. Lightly loosen the noodle and remove any excess flour coating, blanch the wonton noodle in the pot of boiling water and cook for 45 seconds maximum, do not overcook. Rinse under cold or room temperature water few times to remove the excess starch, drain well in a colander. 2. Meanwhile, heat up oil in a large skillet or wok. Sauté the garlic until aromatic. Add Veggies (A) and sauté for about 3 minutes until slightly brown. Then add light soy sauce. Add Veggies (B) and sauté until cooked. Dish out from wok and set aside. 3. 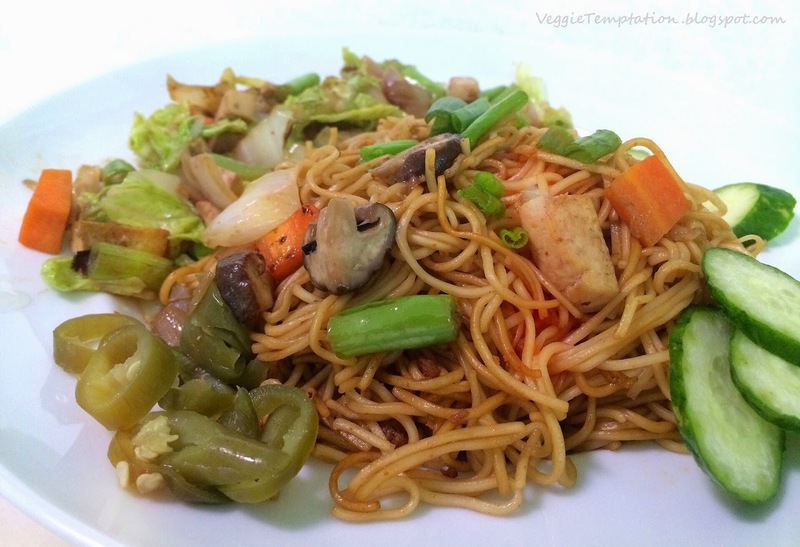 Pour drained noodles into wok, then add all seasonings. Use a pair of chopsticks, toss until all ingredients are coated evenly under very low heat. 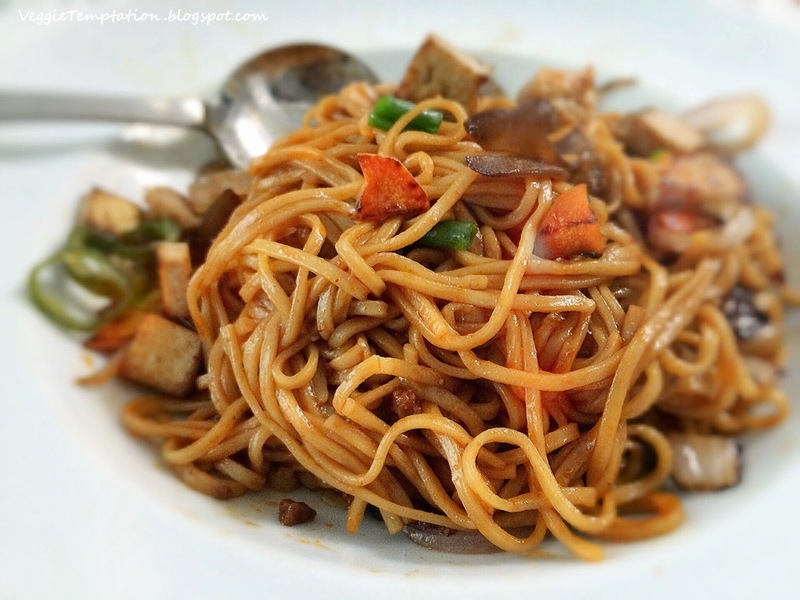 If you prefer your noodles to be a bit soupy, add more water to your desired consistency. 4. Transfer noodles to individual serving dish, then top with veggies and some vegetarian char sao (roasted meat) if desired. Garnish and serve immediately. Hi Daphne, I made this that day, one word.. AWESOME ! ♥ My name is Daphne Low from Singapore, Asia. I'm a self-employed with a lovely family. I'm a Lacto-vegetarian by choice since 2003. WHY? For better health, animals, humanity and environment. I am a free thinker. Thanks for dropping by, do feel free to drop me a comment or question, or let me know if you have tried my recipes. I'll be so thrilled to hear from you! It is the common misconception that vegetarians only eat 'grass' or lots of fried & mock gluten. I started this blog to spread vegetarianism / veganism and let the community understands that vegetarian/vegan cuisine can be delicious, creative and healthy too. ☼ No meat & fish, of course. ☼ All whole-grain flour in baking. -- Buddhist can omit or replace with ginger. -- Vegan can replace with non diary-milk, vegan cheese and butter. I have literally less than a handful of vegetarian/vegan friends around me, and love to meet more like-minded people. Do add me at Facebook and subscribe for the updates in my blog! ♥ Subscribe here to not miss out on my weekly updates on recipes, eateries & where to buy! Be sure to confirm your subscription by clicking the confirmation email in your Inbox. All do not take meat & fish. No eggs but take dairy products. Take both eggs and dairy products. Some take eggs, some do not. Most take diary products but do not take vegetables in the allium family: onion, garlic, scallion, leek, chive, or shallot. Most take both diary products and vegetables in the allium family. No meat/fish, eggs, dairy products or any other animal products. Click to understand more types of vegetarians and why! ♥ Make Caramel from Sweetened Condensed Milk - Just One Ingredient! ♂ Nutritional Yeast - Where To Buy? ♂ Whole Wheat Flour - Where To Buy? ♂ Indian Black Salt (Kala Namak) - Where To Buy? ♂ Vital Wheat Gluten - Where To Buy? ♥ Learning a new cuisine is actually not that challenging, it is the process of understanding & finding the ingredients in your area which is tedious and time-consuming. Thus, I am most willing to share with readers (Singapore, Malaysia and international) where I get the most value-for-money ingredients that are slightly uncommon. For my international readers, these are the exchange rates for your reference: SGD1 = USD0.8 = EUR0.57 = RM2.5. ♥ Do you sometimes wish to go meatless and yet do not want to feel outcast in the social and business context? Fret not! Check out the list of local (Singapore) vegetarian-friendly eateries below which guarantee your load of vegetarian choices even with all the carnivores around! ♥ Singapore and Johor Bahru is just one small custom away by road. Hope these sharing of vegetarian outlets give you some ideas of where to go for your next trip to JB! ♂ Raw Nuts (Cashew Almond Walnut Peanut Brazil) - Where To Buy? ♥ Drop me a personal text, love to hear from u! 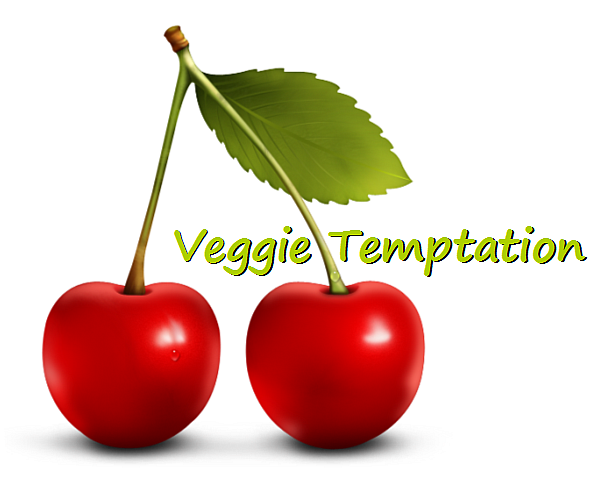 Copyright 2014 of Veggie Temptation ☼ . Picture Window theme. Theme images by hatman12. Powered by Blogger.